The U.S. just slapped heavier economic sanctions on the Nicaraguan government for its violent repression of protesters. 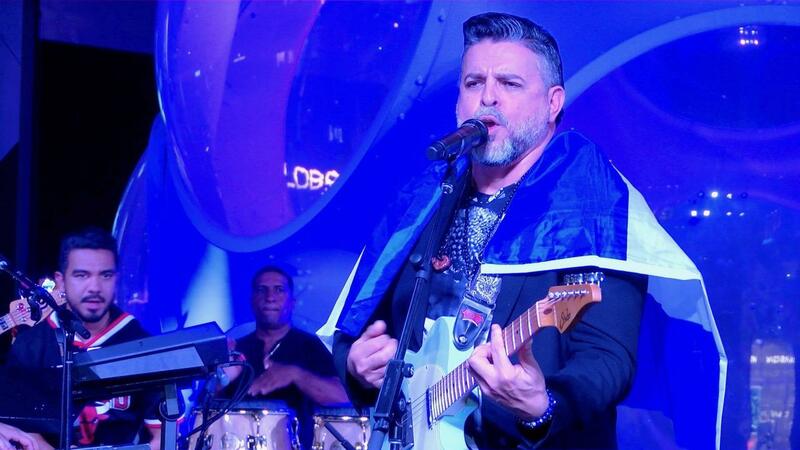 Among the Nicaraguans denouncing that regime here in South Florida is the Grammy-winning singer-songwriter Luis Enrique. Known as the “Prince of Salsa,” Luis Enrique today lives in Miami – where his new protest anthem “Mordaza” is a popular hit. In the “Mordaza” music video, Luis Enrique performs wearing a blindfold that says “Justice,” and the imagery gets much darker from there: menacing masks, bloody knives and the prison torture of a woman who has a mordaza, or gag, in her mouth. “I wanted to show Nicaragua as a woman, as a woman that is repressed and a woman who is losing [her] kids, fighting against evil,” Luis Enrique (whose full name is Luis Enrique Mejía Godoy) said in a studio in Little Havana. When Nicaragua’s left-wing Sandinista Revolution overthrew right-wing dictator Anastasio Somoza in 1979, Sandinista leader Daniel Ortega became the country’s president for the next decade. Luis Enrique believed then that Nicaragua was on the right path. Ortega’s first presidency lasted until he was voted out in 1990. He was elected president again in 2006 and has remained in power ever since, heading what many Nicaraguans consider a corrupt and dictatorial regime. Since April, hundreds of thousands of them have demonstrated against Ortega and his wife, Vice President Rosario Murillo, demanding they step down. But Ortega’s security forces have instead cracked down in brutal fashion – and human rights groups say more than 300 protesters have been killed. More are in jail or missing. More than 100,000 Nicaraguans live in Miami – and most of them are also calling for Ortega’s ouster. “In [Luis Enrique’s] song, what he was explaining is pretty much what the people in Nicaragua are living right now,” said Nerle Rivas, a founding member of Nicas Unidos, a group that has rallied support for South Florida protests against the Nicaraguan regime. On a recent fall evening, about a thousand fans came to see Luis Enrique perform in Miami’s Design District. At time, he draped himself in a blue and white Nicaraguan flag, and he spoke of leaving Nicaragua in 1978 and crossing the U.S. border as an undocumented immigrant teenager. He also sang a nostalgic song about the beauty of Nicaragua. It was written by his uncle, Carlos Mejía Godoy, a former pro-Sandinista troubadour best known for his battle anthems in the 1970s and 80s, like “No Pasarán” (They Shall Not Pass). Nicaraguan expats like Carlos Harding, who heads the Nicaraguan-American Center for Democracy in Miami, say that family history gives Luis Enrique’s anti-Sandinista anthem added credibility. “You have to understand,” said Harding, “that the Mejía Godoy family in Nicaragua is very important. They are icons of the folklore in Nicaragua, for entertainment and political reasons. The fact that Luis Enrique and his family are not pro-government, [today] it sends a message that something is not right." Luis Enrique performing at the Palm Court in Miami's Design District in October. It’s a big reason, Harding added, that “Mordaza” is so important to the Nicaraguan diaspora. Luis Enrique said he certainly wants the song to inspire solidarity with those suffering under the Ortega regime in Nicaragua. But releasing “Mordaza” does carry personal consequences. While Ortega remains in power, Luis Enrique said he cannot safely go back to his homeland.